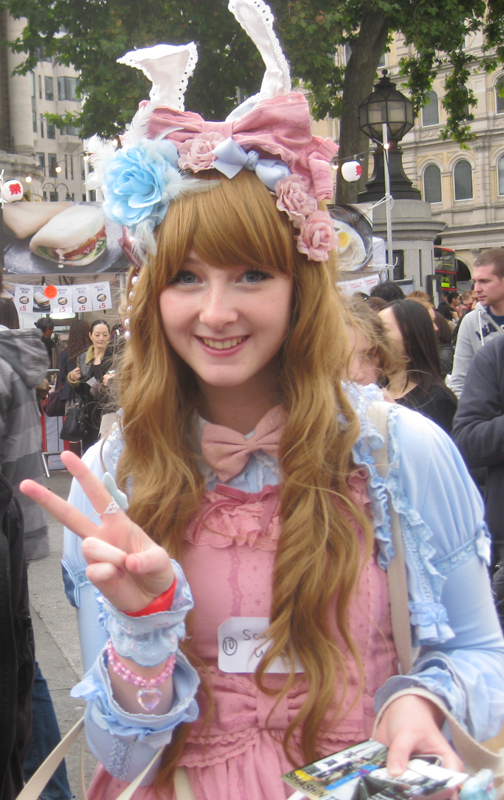 SCARLETT YOUNG is best known for winning the UK Kawaii Star contest at Hyper Japan in 2011 and singing on Japanese TV show Nodojiman The World in 2013. Can you tell me a little about your background and how you first got into singing? When I was a child I liked watching Disney movies, I liked all the songs. I did Stagecoach for a few years and decided I really liked singing, but I really didn’t know where to put my love of singing to use – and then I found J-Pop and I realised that I could sing along to these songs that I love so much and now I’m doing what I love! (laughs). Well I did Stagecoach, but that was when I was quite young and did that for a few years. So I had some singing training when I was younger, but not recently. I like practicing, even if I’m not preparing for a performance. If I have some free time at Uni or something I’ll just go and practice some songs I like. I really like to get my voice to be as good as it could be. You won the first Hyper Japan Kawaii Star comp. How did that change things for you? I didn’t think I could do anything with what I loved and then I entered that because I was like “Oh I might as well, nothing’s going to happen”. Then I won and I was really overwhelmed by all the support that I got. I got to Japan and it was all my dreams coming true. So then I applied for Nodojiman The World thinking nothing would happen. I got an email back asking questions and they were “Oh you’re going!”. It was just completely unbelievable. I just couldn’t believe it. It’s just nice to have the things that you work hard for pay off in that way. What was the reaction in Japan to your performance? Well my performance actually scored quite low in comparison to other people because I was really, really nervous. But I got a lot of comments from people saying “Oh cute!” and stuff like that. They asked me a question “What was your favourite food?” and I replied “Cake!” really excitedly! (laughs). So I had lots of people replying “Cake!” on my Twitter and stuff like that! (laughs). The judges said my voice was pure, but they could tell I was nervous, so I’d love to apply again one time and see if I can do even better when I conquer my nerves. What are your thoughts on the current state of the UK performer scene at the moment? I’m really liking the way it’s going. I mean you see a lot of emerging performers these days and I think it’s great that it’s also a community. When I was talking to the lady at MCM she was saying “Oh it’s nice how all of you go to each other’s performances” and I think that’s true, I think we have built a community this way. All the dancers know each other, all the singers know each other and I think it’s really exciting to be able to see how others are doing what you love as well, if that makes sense. It’s nice to be able to share that with each other. It’s also not necessarily competitive, everyone gets on really well. Yeah I don’t think it’s competitive at all really. I mean my philosophy has always been you get what you want by trying hard yourself – and it’s nice if others do well as well, that’s what I’ve always found. I don’t really think of it as a competitive thing. I like to think of it as setting my own goals for myself. What’s happening with Oishii!Ichigo at the moment? At the moment we’re preparing to release a new music video. There’s been a few delays on that but we’ll be releasing a music video soon. A lot if the members have left recently so we’ve merged all the groups together, so it’s one big group. You’re also part of MK Dance Group, how did that come about? Well actually it was a few years ago we were on the MCM forums and we were just like “Hey do you want to do a Berryz Koubou dance?” and then this all kind of pulled together. I made some really good friends through that. It’s just doing it for fun and to be around my friends and I think that’s really nice. You favour a lot of older anime titles to cover songs from. How were you exposed to these older anime series? I’m not actually too sure! (laughs) I don’t actually watch a lot of the anime I sing the songs to. I like listening to anisongs to find ones that I think I could sing. The style of the older stuff just seems to appeal to me more, the stronger songs like I love ‘Lion’ and ‘Shokotan’, that kind of thing. That’s my favourite style, singers with really powerful voices. I like the cutesy stuff too but as something to sing I prefer the powerful anime songs. You’re a fan of Momoiro Clover Z. Thoughts on their involvement with the new Sailor Moon series and the theme song? Oh yes I love it! I was kind of fangirling when I heard it. The transformation is OK, I don’t know about the CG but I think Momoiro Clover’s song is really great, I love it. I hope they continue to get opportunities like that. I don’t know if you saw the TV show where they did the funny kind of parody where they were all dressed up as the characters! (laughs) I love them because they are ridiculous, I think they’re great! It’s a shame that we can’t get Momoiro to come to the UK, although we’ve come very close. They did the Paris Expo in 2012. Yes, I really, really wanted to go. I couldn’t go at the last minute because I was worried – complications with losing my passport and things. I don’t know if they’re almost too big now to come to the UK. I mean people were commenting “We really want them at Hyper Japan” but they’re huge in Japan now. So I guess they’ve got quite a lot of stuff in Japan to do right now is probably why. Also I don’t think they’re as well known in the UK as a lot of other Japanese artists like Kyary and stuff like that. Are there any new J-Pop artists that you’re currently keen on? I don’t really seem to have a particular group at the moment. I kind of go round YouTube and I find things. I really like Natsuko Aso. I love listening to her. Her songs are really good I find when I’m studying! I don’t know why! (laughs) I always listen to her on repeat on a big playlist when I’m studying. I think hers are really cute. She’s an idol, but she’s a law student at the same time. I thought that was really interesting. So I really like her, she’s one of my favourites at the moment. Your Japanese is very good. How long have you been studying the language? I’m not actually sure. Maybe a couple of years? I didn’t start officially learning until I went to university. At university, even though I’m doing maths, they give you opportunities to have free language lessons in the evening that you can pick up, so I picked up Japanese for a couple of years. I’m really enjoying that and hoping to do it when I go back to uni next year. What are your plans when you leave university? Any plans for the rest of this year in terms of performances? I’m doing Hyper Japan, I’ve got a 5 minute performance in the Kawaii section. Kelsey’s doing it and M.O.E., so yeah that should be really fun, I’m looking forward to that. I’ve got to prepare hard for that. Other than that I’m not sure. I might be doing Alcon, but I’m not sure yet. J-Pop Go extends its warmest thanks to Scarlett Young.